DEWE v2 is a pulling-based workflow execution framework designed with public clouds (for example, AWS) as the target execution environment. With AWS EC2, a homogenous computing environment can be creating by launching a set of EC2 instances with the same instance type in the same availability zone (probably in the same placement group). Statistically, these EC2 instances have the same computing resource in terms of CPU, memory, storage, and networking. DEWE v2 takes advantages of this homogeneity to reduce the scheduling overhead in traditional workflow execution frameworks (such as Pegasus + HTCondor) with a pulling approach. Test results with five 6.0 degree Montage workflows running in parallel indicates that DEWE v2 can achieve 80% speed up as compared to the Pegasus + HTCondor solution on a single node cluster. This blog post provides a Getting Started guide on running DEWE v2 on AWS. To get started with DEWE v2, you will need to have an account on AWS. In your EC2 Console, navigate to the N. Virginia (us-east-1) region and click on the blue “Launch Instance” button. In “Step 1: Choose an Amazon Machine Image (AMI)” page, click on “Community AMIs” and search for “DEWE.v2 ICPP”, you will be able to find the demo AMI we prepared for ICPP 2015, as shown in the screen capture below. Now we have the example 6.0 degree Montage workflow in the /data/DEWE.v2_Montage_6.0_Example folder. We will go ahead and set up DEWE v2 so that it will run. First we run “ifconfig eth0″ to determine the private IP address of the EC2 instance. Then we edit config.properties and replace “master=10.0.4.15″ with the correct private IP address of your EC2 instance. Apart from that, you don’t need to change any other parameters in this config file. In the same folder, you will notice that each daemon produces a PID file containing the pid of the process (for example, master.pid, worker.pid, and monitor.pid), as well as a log file containing the output from the process. The file name of the log file contains the private IP address of the EC2 instance, as well as the date and time the daemon is started (for example, worker-ip-172-31-27-138-2015-08-15-10-02-31.log). You might see multiple entries of workflows in the status output. Those are the records from our own testings. You will need to look at the time stamps to determine which entry is really your own workflow. At this point it would be worthwhile to look into the log files produced by the various daemons. In particular, you should look into the log file produced by the monitoring daemon to understand the status of computing resource utilization. The fields in this log file include UNIX timestamp (in seconds), the average number of concurrent threads observed on the operating system level, the percentage of CPU utilization, the number of disk I/O operations (the sum of reads and writes) per second, disk read throughput (KB/s), and disk write throughput (KB/s). After you finish this exercise, you should terminate the EC2 instance in a timely manner to avoid further charges. In this step, we will create a more complex set up – a cluster with three compute nodes with MooseFS (a POSIX-compliant distributed file system) as the underlying storage. In order to do so, we will launch a separate MooseFS master node to manage the storage nodes. The storage nodes will be at the same time DEWE v2 worker nodes. One of the worker nodes also acts as the DEWE v2 master node by running the DEWE v2 master daemon. We will need to launch the MooseFS master node first. In your EC2 Console, navigate to the N. Virginia (us-east-1) region and click on the blue “Launch Instance” button. In “Step 1: Choose an Amazon Machine Image (AMI)” page, click on “Community AMIs” and search for “DEWE.v2 MooseFS”, you will be able to find the demo AMI we prepared for ICPP 2015, as shown in the screen capture below. You will need to select the AMI with the name “DEWE.v2 MooseFS Master for ICPP 2015″. The MooseFS master node does not need a whole lot of processing power, so I select a t2.medium instance type for this exercise. If you see outputs similar to the following, your MooseFS master node is now successfully running. Now we will launch three additional EC2 instances to run DEWE v2. Similar to what we do in the single node configuration, we click on “Community AMIs” and search for “DEWE.v2 ICPP 2015″ to search for the AMI to use. In “Step 2: Choose an Instance Type” we choose c3.2xlarge, which has 2 x 40 GB instance-store volumes. In “Step 3: Configure Instance Details” we specify 3 for the number of instances, this way we do not need to launch 3 instances one by one (which is not a problem but troublesome). On the same page, we click on “Advanced Details”, and paste the following into the text area for “User data”. It should be noted that you should replace 172.31.31.83 with the private IP address of your MooseFS master node. It is very important that the security group being used on the MooseFS master node and the security group being used on the DEWE v2 compute nodes should allow all traffic between the MooseFS master node and the DEWE v2 compute nodes. After the DEWE v2 compute nodes became “running”, you should be able to see outputs similar to the following on your MooseFS master node. The MooseFS master node sees three storage nodes, and uses the disk space (/mfshdd) on the the storage nodes to form a shared file system. The shared file system is mounted on each of the three storage as /FoxData. Randomly select any one of the three DEWE v2 compute nodes to run the DEWE v2 master daemon. SSH into this node using username “ubuntu”, do an “ifconfig eth0″ to determine its private IP address. Then we edit config.properties and replace “master=10.0.4.15″ with the correct private IP address of your EC2 instance. Apart from that, you don’t need to change any other parameters in this config file. Copy config.properties to /FoxData so that the other two compute nodes can copy it from the shared file system. Now SSH into the other two DEWE v2 compute nodes, copy the configuration file configure.properties from /FoxData, then start the worker and monitoring daemons (no master daemon). You can use the “top” or “isolate 1″ commands to observe what your EC2 instance is doing while running your workflow. On a cluster with 3 x c3.xlarge compute nodes with MooseFS as the underlying distributed file system, the time needed to execute two 6.0 degree Montage workflows is around 25 minutes. After the workflows are completed, back up the log files on all three DEWE v2 compute nodes to a persistent storage (such as AWS S3) for further analysis. Please remember to terminate all the EC2 instances (the MooseFS master node, and the three DEWE v2 compute nodes) to avoid further charges. In this step, we will show you how to create your own workflow that can be executed by DEWE v2. We used the example as shown in the directed acyclic graph (DAG) below to illustrate this process. The entry task of the workflow is a “Sleep” task, which simply sleep for a random amount of time (0 to 100 seconds). Before the “Sleep” task is completed, no other task can be executed. 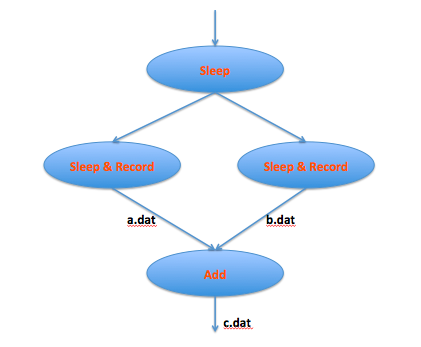 After the “Sleep” task is completed, two “Sleep & Record” tasks will run in parallel, each sleeps for a random amount of time (0 to 100 seconds), and records the random number into it’s own output file a.dat and b.dat. After both “Sleep & Record” tasks are completed, exit task “Add” adds the outputs in a.dat and b.dat, producing a final output file c.dat. After the workflow is completed, you should be able to see a.dat, b.dat, and c.dat under folder /FoxData/DEWE.v2_Simple_Demo/workdir. Now let’s explain the directory structure of a DEWE v2 workflow. Under the project folder, there are three sub-folders – the bin folder contains the executables, the src folder (optional) contains the source code, and the workdir folder (initially empty) contains the input and and output files. Apart from the three folders, dag.xml is the XML representation of the DAG of the workflow, while timeout.xml is the XML representation of the timeout settings for each task. The dag.xml usually contains three parts. The first part describes the input and output files, the second part describes each job and the arguments, and the third part describes the precedence dependencies between jobs. The jobs and their arguments are described as below. 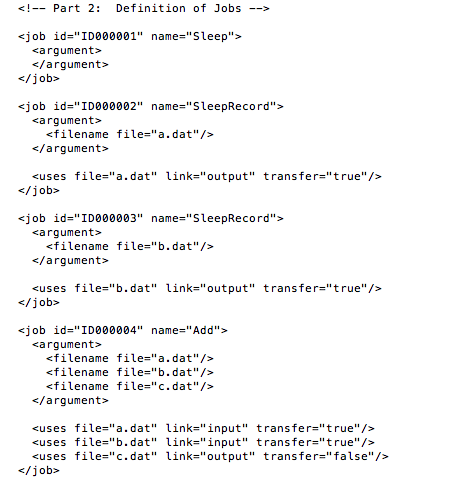 The executable binary for job ID000001 is “Sleep”, and this job has no arguments. The executable binary for job ID000002 is “SleepRecord”, and the argument for this job is “a.dat”. The executable binary for job ID000003 is “SleepRecord”, and the argument for this job is “b.dat”. The executable binary for job ID000004 is “Add”, and the arguments for this job are “a.dat”, “b.dat”, and “c.dat” in the sequence as they appear in the command line. The precedence dependencies are described as below. Job ID000002 and ID000003 are child jobs of job ID000001. They can not start execution until job ID000001 is completed. Job ID000004 is a child job of both job ID000002 and job ID000003. It can not start execution until both job ID000002 and job ID000003 are completed. Configuration file timeout.xml defines the timeout period for some special jobs, while the default timeout period for all jobs is defined in the DEWE v2 configuration file config.properties. In the example below, the timeout period for job name “Sleep” is 150 seconds, while the timeout period for job name “SleepRecord” is 200 seconds. If a particular job has been running for more than its timeout period, DEWE v2 will resubmit the job for execution. This work is supported by the AWS in Education Research Grants. Dr. Young Choon Lee would like to acknowledge the support of the Australian Research Council Discovery Early Career Researcher Award (DECRA) Grant DE140101628. 1. Launch an EC2 instance with the g2.8xlarge instance type, using a Ubuntu 14.04 HVM AMI. When I launched the EC2 instance, I used a root EBS volume of 300 GB (General Purpose SSD) to have a decent disk I/O capacity. With general purpose SSD, you have 3 IOPS for each GB of storage. So 300 GB storage gives me 900 baseline IOPS, with the capability to burst up to 3000 IOPS for an extended period of time. This article provides a quick started guide on how to set up and configure XtreemFS on Amazon Linux. Two EC2 instance are being launched to accomplish this goal. On both EC2 instances, there is an instance-store volume serving as the shared storage. On both EC2 instances, create file system on the instance-store volume and mount it to /xtreemfs. Now the shared file system has been set up, and you can create a text file under /data and observe that the file created appears on both EC2 instances. (1) Before creating the AMI, remove the UUID lines from the above-mentioned configuration files. Please bear in mind that this is only a quick start guide, and you should not use this configuration directly in a production system without further tunings.